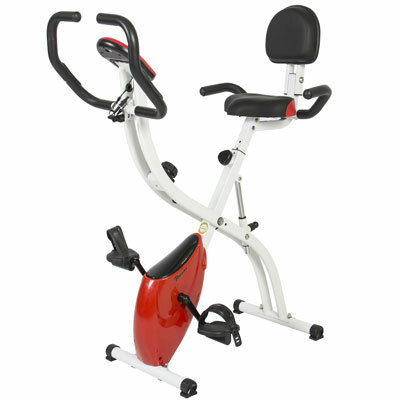 Best Choice Products offers a wide array of home fitness equipment, including several exercise bike models. One of their most affordable and highest rated product in this category is the SKY2380 folding adjustable upright bike. 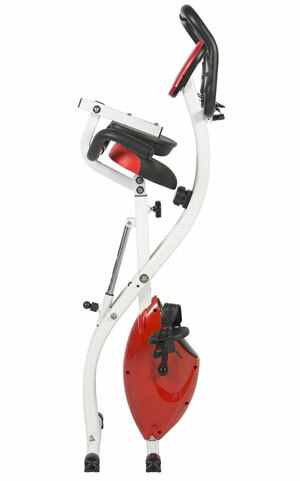 This exercise bike is actually a hybrid bike, as it offers both upright and recumbent workout possibilities. It’s pretty similar to the Sunny SF-RB1117, but as opposed to the Sunny model, it offers 3 adjustment positions on the frame, and adjustable handlebars. Even though it’s a pretty basic and affordable bike, we’re pretty sure you would like to know as much as possible about it. Therefore, in this review we’ll cover in detail, each and every one of its features. This Best Choice Products exercise bike features an “X” type frame, which folds at the middle, offering better storage possibilities. It locks in folded or in use position via a bar that connects the seat tube to the rear base tubing. This locking bar actually features 3 adjustment holes. One is for locking the bike in its storage position, the 2nd offers an upright position, while the 3rd supplies a recumbent position. However, the recumbent position supplied by this bike is not exactly perfect. The seat will remain a bit higher in relation to the pedals, and your legs during a recumbent workout won’t be in a completely horizontal position. The bike’s frame is made of steel, coated with corrosion resistant paint. It’s pretty light, the assembled bike weighing only 40.35 lbs (cca 18 kg), thus almost anyone should be able to lift it, fold or unfold it, and carry it around without much trouble. Also, due to this fact the front base does not integrate transport wheels. The base bars feature plastic caps and rubberized stabilizers, offering decent stability. Overall, the assembled bike isn’t very large. It takes only 26″L x 21″W (66 x 54 cm) of floor space, but the handlebar and seat extend a bit further, when the frame is locked in the 3d position. Thus, you’ll need a space with a depth of approx. 50″ (127 cm) to use the bike properly. 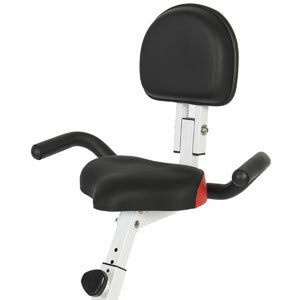 This BCP folding exercise bike is equipped with a pretty large, contoured seat. Its padding is quite thick, but does not integrate air cell cushioning, such as the seat on the Ironman 410 X-Class, for example. The seat has a small backrest, also thickly padded, which offers and excellent lumbar support. The backrest can be folded forward over the seat, in case you need to. The seat offers 2-way adjustability. Its post has several adjustment holes, the bike being able to accommodate comfortably users between 5’2″ and 6’2″ (157 – 188 cm). The bike features two sets of handlebars. One is attached to the seat assembly, meant to be used when the frame is locked in its recumbent position. These handlebars are non-adjustable. On the other hand, the front handlebars of the bike are attached to the main tubing of the bike with a knob, and their angle is adjustable. They feature a multi-grip design, and integrate stainless steel pulse sensors. Both sets of handlebars are coated with rubber foam material, to offer a comfortable grip. As the title of this post suggests, this bike features magnetic resistance. It’s a manual-magnetic resistance system though, featuring a magnetic pad, connected to the bike’s tension knob, via a steel cable. By turning the knob, the magnet changes its position in relation to the flywheel, providing more or less resistance. There are 8 distinctive resistance settings marked on the tension knob. The lowest ones are rather light, but the top ones do offer quite a bit of a challenge, even for a user with a medium level of fitness. The integrated flywheel is balanced, offering a steady pedaling motion, and since there isn’t any friction involved between it and the resistance pad, pedaling is really smooth and quiet. Pedaling in reverse is possible. And since the bike features a magnetic sensor that counts the rotations of the flywheel, the fitness meter will continue to track distance even if you pedal backwards. Resistance doesn’t change when you pedal in reverse. If, for example, you choose the 5th resistance setting, regardless the way you pedal, you will be using the same resistance. Finally, a set of weighted pedals with standard 9/16 threads, is supplied with the bike. They’re weighted, and feature adjustable straps. Evidently, since it’s an inexpensive bike, the fitness meter supplied with it is pretty basic as well. But nonetheless, it can track speed, distance, time, calories burned and pulse. It has a SCAN function that rotated between these values, keeping each one on screen for several seconds, but you can also select one of them to view at all time, if you want. In order for the unit to track your pulse, you will have to hold onto the pulse sensors integrated in the front handlebars. The recumbent handlebars do not integrate pulse sensors such as in fully dedicated recumbent bikes. 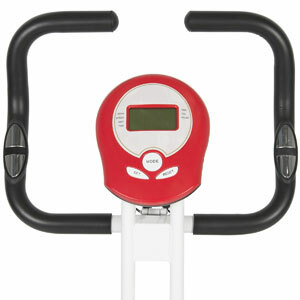 The fitness meter is easy to use. It features 3 buttons (SET, RESET and MODE) which cover all of its functions. It starts up when it detects flywheel movement, and automatically turns off after several minutes of inactivity on the bike. The values from the previous workout are kept though. The unit uses 2 AA batteries. This exercise bike if quite easy to assemble. The two main parts of the frame come already attached together, and the mechanism case fully assembled. You basically have to add the bike’s bases, handlebars, seat, pedals and the fitness meter. The whole task shouldn’t take more than 30-45 minutes. Tools for assembly are supplied, along with a manual. Since the bike features a magnetic resistance system, the brake pad isn’t a wear part, so it doesn’t require replacement. The bike uses a belt drive, therefore transmission doesn’t require lubrication. So, basically the whole maintenance requires you to wipe the dust off the bike, and occasionally check and re-tighten the bolts and screws if it’s the case. No tablet or water bottle support. 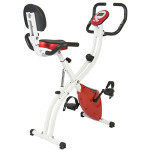 This Best Choice Products folding exercise bike is one of the most affordable models that you can find at the moment. It offers several features over other similar models, such as adjustable front handlebar, and 3 position settings on the frame. It also includes a fitness meter. It’s great for anyone who doesn’t have the luxury of space, as it has a small footprint, also being foldable. It’s a bike made for light to medium cardio training, for building stamina, toning muscles and of course, for losing weight. Thus, it’s pretty safe to say that this exercise bike offers excellent value for the price.